Custom lens imprinted Malibu sunglasses can be used for any business, brand or event. These sunglasses make great wedding favors, picnic gifts, resort giveaways, family reunion gifts, community giveaways, park district giveaways and corporate retreat gifts. Avail attractive price savings on wholesale sunglasses. These sunglasses have serious quality and lenses offer 100% UVA and UVB protection. The sturdy construction of these sunglasses means that they will be available for few years and your brand logo will be seen far and wide. 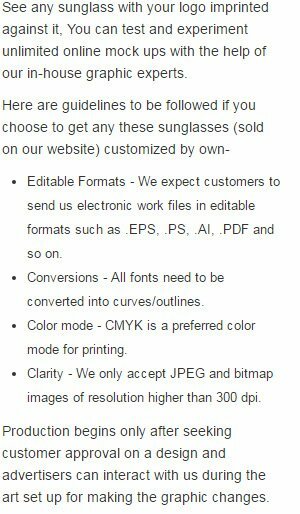 Request a quote to know discounts that you can avail on bulk ordering these promotional Malibu sunglasses. When ordering blank items of this product either exactly 1 or atleast '+200+' must be ordered!